Collected batteries are emptied into a large hopper, which feeds individual batteries and bags of batteries down onto a conveyor belt. 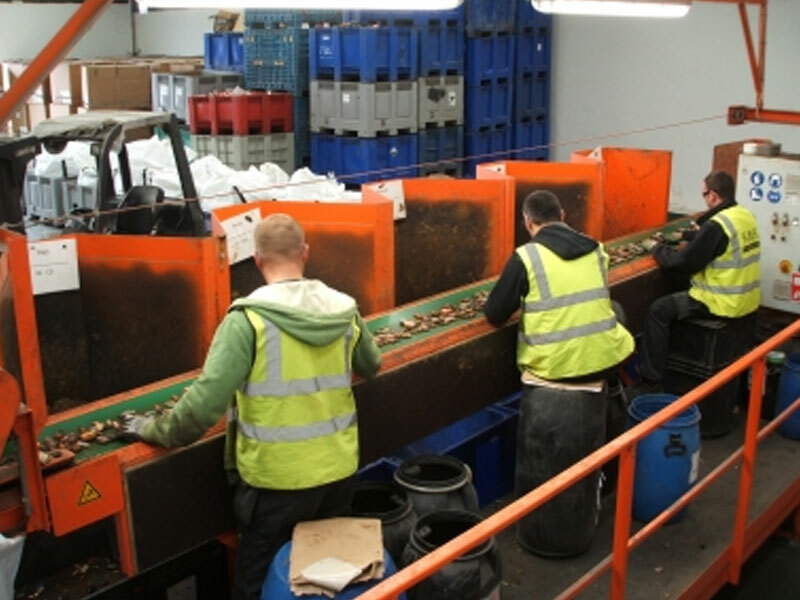 Experienced personnel identify and sort the individual batteries by type and by chemistry. Materials travel the conveyor and initially are sorted by removal of the following fractions into dedicated bins: rubbish, Lithium, 6 Volts, Packs, Bags, Lead, WEEE Waste. They are put aside and gathered separately. Bags and packs are in turn put through the hopper for a second sort. Bags are opened as they arrive at the sorting personnel and are split into the same fractions as above. Packs are sorted by chemistry, whether they are Nickel Metal Hydride (NiMH), Nickel Cadmium (NiCd), Lithium Ion or Lithium. All remaining batteries reach the end of the conveyor and are collected as are Alkaline/Zinc Carbon Batteries fractions which are quality checked before they are prepared for shipment. Different battery types and chemistries take bespoke export packaging which KMK manages in line with legislation and outlet expectations.